Apologies to anyone who found contacting us difficult around the end of February. For reasons beyond our control, the website and associated mailboxes were out of action for an annoyingly protracted period - how long it takes the host to allow payment details to be updated! The Society of Ancients Website is back and fully functioning. The online subscriptions and payments services are available, and email contacts are live. Behind the shop-front, there have been some changes. Mark Watson retires as editor with issue 268 that has just gone out. Many thanks are due to Mark for the fantastic job he has done; for masterminding the journal's makeover as well as two years of great content ... and then staying until we could find a new editor! Richard Taylor takes over with 269 (and inevitably, thanks are also due to Richard who, in turn, is taking over earlier than originally planned) - please extend him all your support. Daivid Barnsdale steps up from the Championship's leading advocate (and most prolific player) to Wargames Championship Organizer. Thanks go to Bill Thurlow for steering the Championship through its trial year in 2009. Contact Daivid at Championship@soa.org.uk and please start registering games via the website submissions form. As well as kudos and crockery, the 2010 Championship boasts an attractive extra prize of £100 worth of 25mm figures donated by Hinchliffe. More sponsorship will be announced during the course of the year. The Championship is open to any current Society of Ancients members, and runs throughout the membership year. Computer games are allowed as well as traditional formats, and online games possible with the agreement of both players (check the website for more detailed rules). 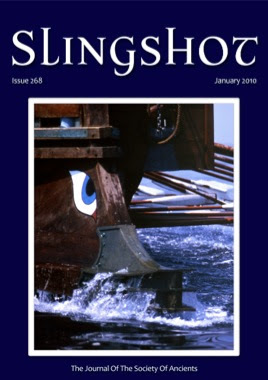 A 2010 subscription to the Society of Ancients costs £20 and brings the full range of member benefits and discounts as well as 6 issues of the Society's celebrated journal, Slingshot. You can become a member by applying online (here ...), contacting the Membership Secretary, or meeting us at a show or event.